When scrolling through Twitter you sometimes come across cards that you must have. Now, this happens quite often with me, but I usually don't ask about a trade due to my trading conditions. If you forgot what those are, I havr to know the other person, get references/background check on them with already trusted traders and make sure everything about them is safe without any red alarms. Yes, you would think I am renting to a person or giving them my kidney and not trading cards. Call it OCD or whatever my issue may be, I have a 100% trade success that way. With my latest trade however, I didn't need to do that. Almost since I have been blogging, @Seahawksfan605 has been reading, responding, entering contests and interacting on social media with me. So I absolutely had no concerns trading with him. My mail day reflects the great guy he is because he threw in some bonuses as well. I will be sharing those first! 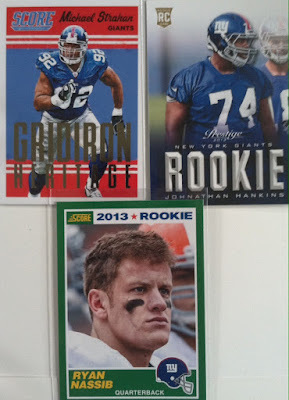 The first three bonuses include, Strahan, I gotta see if this helps my set in 2015 Score Gridiron Heritage, Hankins is looking like he may have a big year and Nassib has shown some glimpses in the preseason. 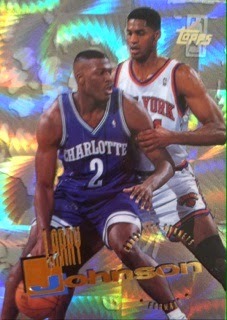 And finally I will reveal the card that sparked the trade. 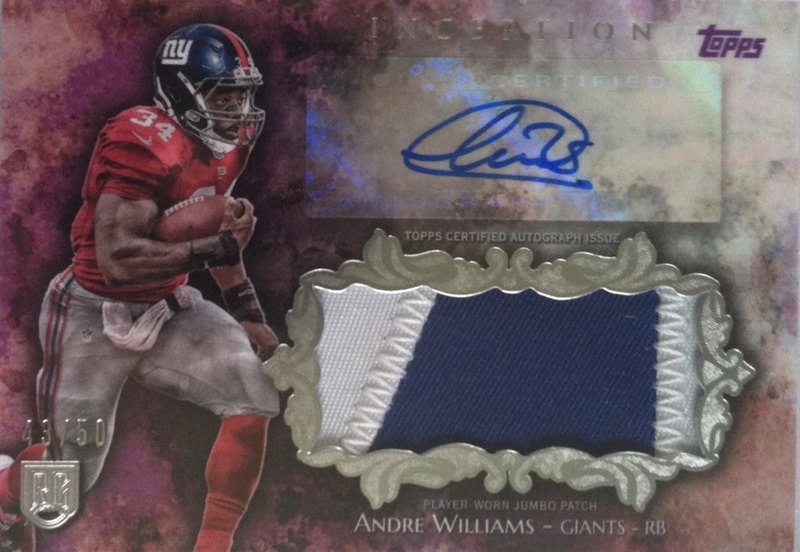 A new Andre Williams for the PC. I really need to update how many I have. I guess I can when I have a minute haha. 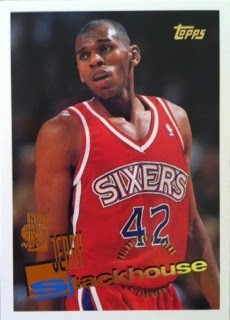 This card despite his wrong jersey number is plain beautiful all around. 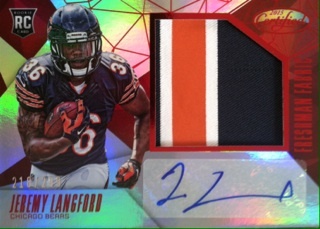 The patch is nice, the numbering is to 50 and the overall look catches your attention. One of my new Williams favorites! A big thanks goes out to @Seahawksfan605 for the trade and the ease of the trade. I am glad that you got your part of the trade today as well and that we worked this out so fast. I look forward to possible future trades with you as well. Thoughts on my mail days are always welcomed! Up close these two Anthony Millers look the same. But if you flip them around, you find out that they are not. Match Proof parallel is what I had found. Not something I had ever seen or heard of and most of the time never would have noticed if I hadn't sorted the cards by number. So I did a little research on them. 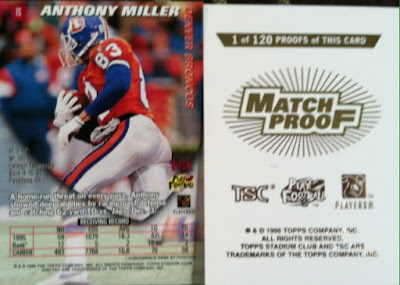 Match Proof in Series one fall at a tough rate of 1:240 packs. 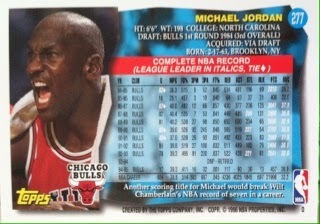 Each card in the 90 card set has a Match Proof parallel and they are numbered to 120 sets of each. The only thing that separates them from base is the gold foil on the back as you see above. 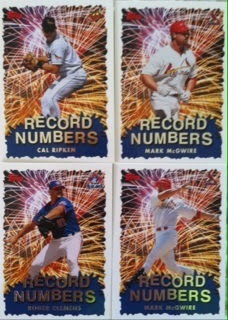 The ones in Series 2 are much easier to find at 1:150 packs, however those are only numbered to 100 sets of each. I think this was a great find for my 90's PC and I was fist pumping the air when I saw that I had pulled something cool. It's both something unique and rare. This is the kind of fun that busting older products can bring. You knew a topic was coming with this one. 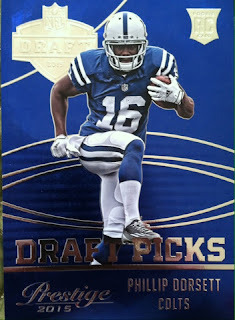 Have you ever found a great card that you may have missed the first time around in a card pack or random stack you bought? Maybe it was even already in your collection? I want to hear all of the details! Your reaction, what it was you found and how you discovered it. Well, well, well. Here we are finally. The last break from my auction lot back in May. Of course I stuck with the number one rule, you save the best for last. So here we go! 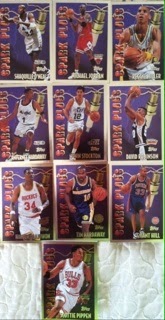 In every box of 1995-1996 Topps basketball is packed with 36 packs with 10 cards per pack. 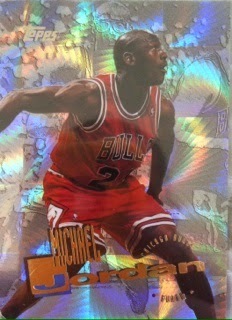 There are lots of shiny inserts and most importantly, Michael Jordan in the base and inserts. 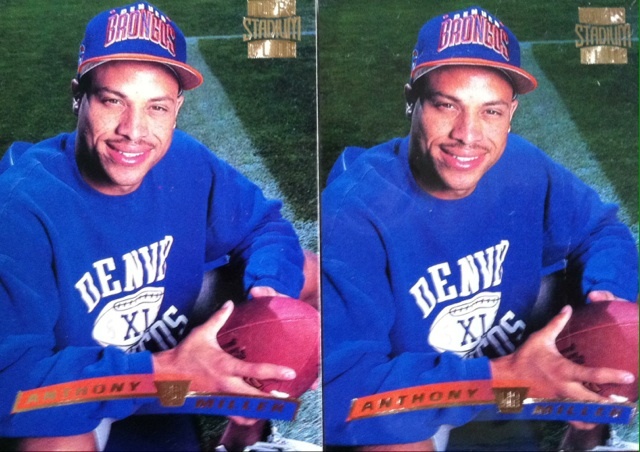 The base cards design for 95-96 isn't too bad. 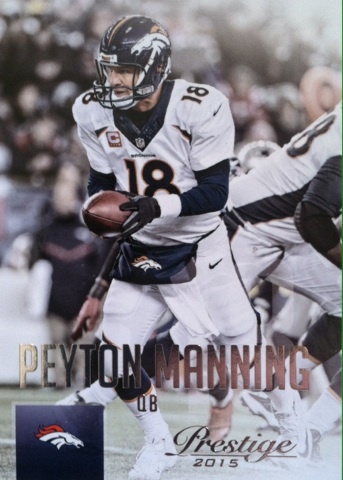 There are some great action shots and the border is thin leaving the base card with a full photograph. 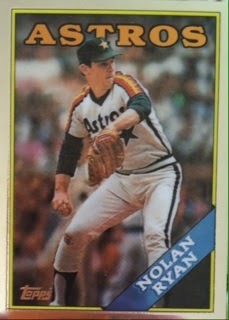 The player's name may be a bit too big, but the gold foil it's done in makes it look nice. Rookie cards. They say draft pick on the side. Rattle and Roll inserts look really cool. Very 90's look! Spark Plugs! I finished an entire set in two boxes. 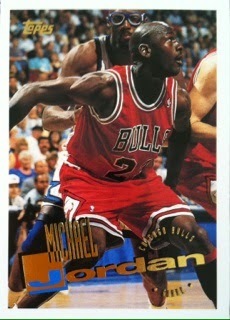 You will find many, many of them as I had many doubles except of the one that's worth the most, you guessed it, MJ. Mystery Finest. These fell at one-per-box or 1:36. Another MJ sighting! Woo hoo! BOOM MJ! Best first pack I have ever opened! Overall, WOWZERS! This was probably the most impressive basketball break I have had for some time. After busting the first box, I couldn't wait to rip the second. This was amazing break and value. No doubt my best break of the entire auction. Crown Royale was one of my favorites in the 90's and just like yesterday, it was another top notch release done by Pacific. They seemed to know how to make cards and especially great base cards. If only they could have survived. I think great things would have come from them in today's market. I have always been a fan of the crown die cut no matter how they positioned it. I am happy that Panini revived the product. 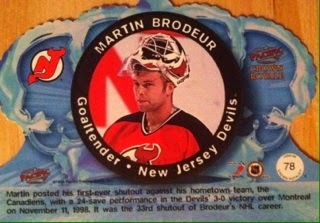 I acquired this Brodeur via trade with my father like some of the other hockey ones in the 90's I have recently been posting about. I still have more to go. 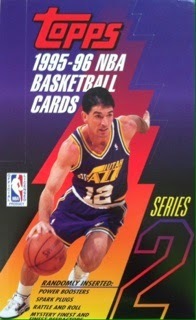 I must also note, that 90's Flashback will go away for a bit as I transition to a new way to display 90's cards. I am far behind on shout outs and stuff to show off so will have a new post that will be featured on Saturday's. When I am caught up,this form will return unless the other form is more popular. Sport Card Collectors Fantasy Football League! So I created a league and the first 19 people(besides some special invites I sent out ahead of time) to email me at sportcardcollectors@hotmail.com (please put fantasy in the subject and your email in your message for easier contacting) or comment below with their email addresses can join in my league. Not sure if there will be prizes or not. I mostly set up the league for fun and to talk trash lol. Since I am not one for live drafts, to make things even more interesting in this league, the draft will be randomed to us. (You can set preferences for your teams draft in the my team section) That's right, we will be assigned players so we may need to be doing some serious trades and free agent signings! That way also you guys won't have to worry about being there for a draft too. Good luck and hope to fill this league! Let me know in comments also if you are in! 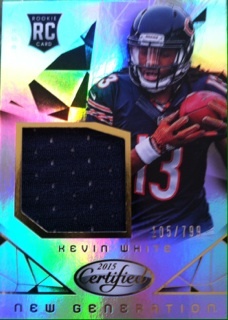 One of my favorite Panini products, Certified comes blaring out of a box full of shiny goodness. How did I fair with this box...well...you need to read on! Before I continue on, I must thank Panini America for the review box and you can look for some of these cards in a future giveaway. Please take a minute out to thank them as well. 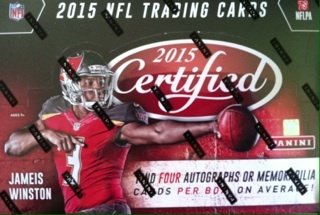 Every box of 2015 Panini Certified football comes with 10 packs per box and 5 cards per pack. There are four hits per box, 2 auto (one is supposed to be a patch/auto), 2 memorabilia and boxes will run ya around $90. 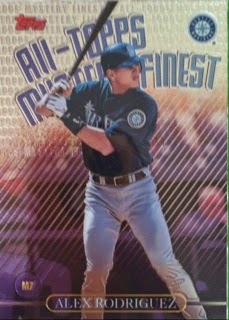 Base cards for Certified remain the same, a silver foilboard. However, this years looks much better with the addition of a designed background. I think they look really sharp. 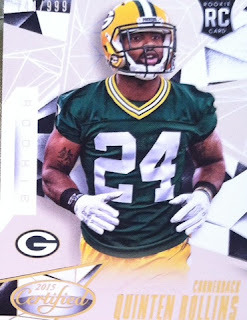 There are 100 vets, 75 rookies and 25 Immortals shaping up the base set. Rookie cards are still numbered to 999 as well. They also don't seem to fall too many per box either. This is the Immortals. They also are numbered. The Young is a mirror red numbered to 99. These parallels stand out even more now with the background design. SHINY GOODNESS! Check these bad boys out! 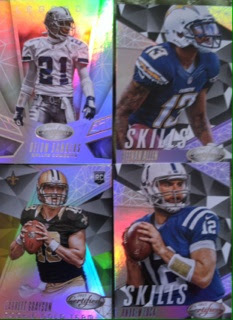 You should find two Mirror Silver parallels, one Mirror Silver Rookie, one Skills insert, one three Stars inserts and one Certified Legends. Here are the Mirror Silver parallels. Look awesome! I beat the odds here and pulled three Legends inserts. This one is of Deion Sanders. 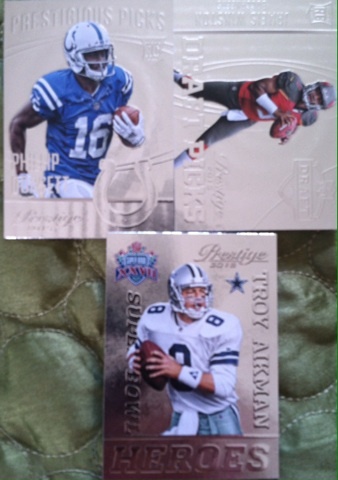 Elway is a Mirror Red and Namath is a Mirror Gold numbered to 50 of Legends inserts!! 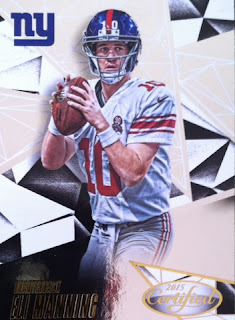 Here is a Gold Team and three Stars inserts including the biggest of them Odell! More shiny goodness. 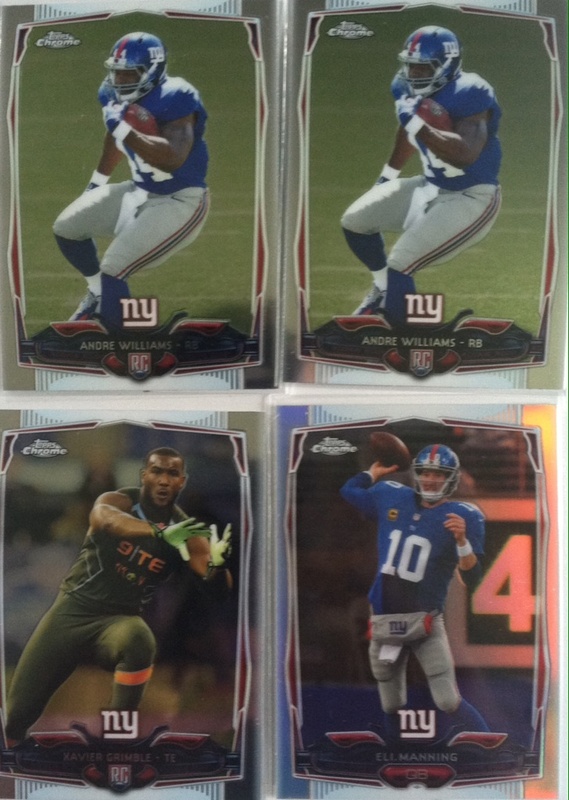 New Generation jersey cards numbered to 799. These are also done in the base card design. I like the balance of the card with the swatch. 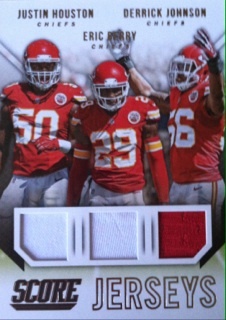 These are the kind of one-colored jersey cards I can deal with. I bet patches look amazing on these. All of you sticker autograph haters, not me as I see an auto as an auto no matter what it's written on, you might not like the two pulls from my box. 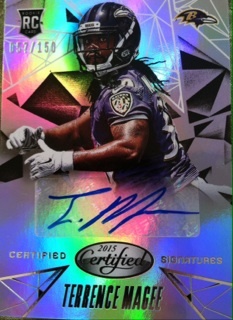 Here is a Certified Signature of Ravens Terrence Magee. 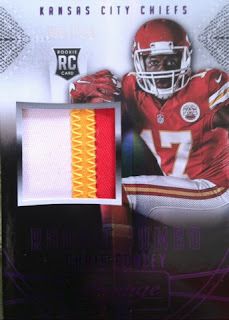 And my best pull of the box in my Freshman Fabric. Jeremy Langford. Look at how beautiful this card looks. Even the poor signature doesn't take away from the card. This may possibly be the best designed Freshman Fabric card yet! As a collector who really enjoys things that glisten, I had a blast opening this box. 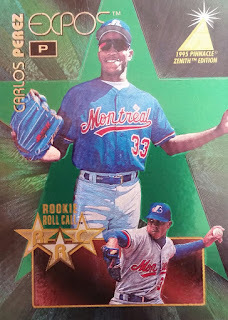 Chasing the rarer parallels made for a great pack opening experience as I kept hoping for one in every pack. With that being said, 4 nice looking hits, a base set worth collecting, some numbered cards and the rare parallel chasing makes this one fun break. The price point is a bit steep, but I think the big hits can be found so if you wanted to take a risk on a product, I think this is the one you should definitely rip. Aurora, another great Pacific brand, was always a fun product. 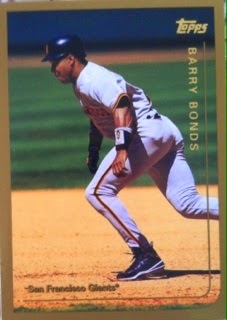 This specific year had some great looking base cards with 3/4ths being full color and the last 1/4th of the card being a bronze foil photo double. Once again, you can't appreciate a card like this until you see it up-close. What was my tough pull? READ ON! 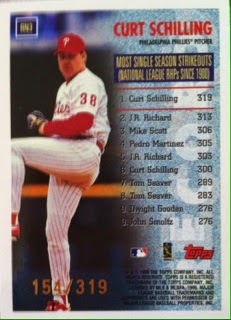 In a box of 1999 Topps Series 2 baseball, you will find yourself busting 36 packs with 11 cards per pack. So you get a lot of cards in a box. 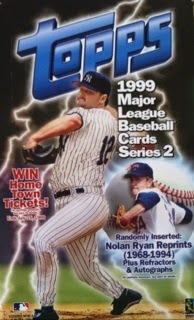 The base card design wasn't too shabby in '99, the only part I didn't like was how bad the cards chipped. 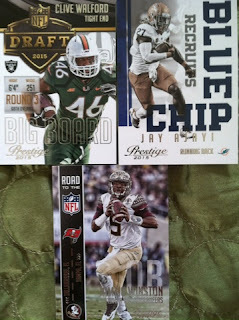 Rookie cards. Once again, rookies, prospects and whatever you call them in baseball just frustrate me. I only call a rookie a true rookie when Beckett does. 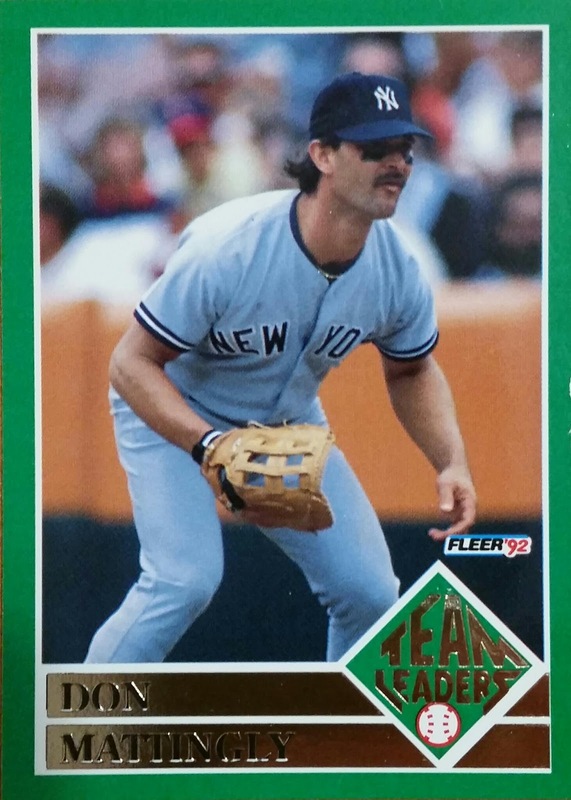 But, I guess everyone has their own definition but it irks me endless that baseball cards are so confusing for rookie cards. A player shouldn't have a card marked rookie card or prospect three years in a row. Subsets. I like the ones with trios. Some incredible ones to find including one that I did for #MissionGriffey. Sammy Sosa HR Parade "inserts". 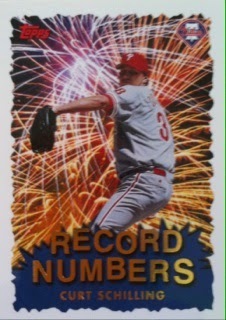 They are technically all card #461 with 66 different varieties celebrating Sammy's big year. 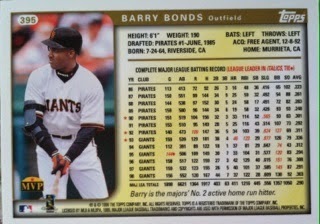 But, in order to call a base set a base set, you must include one of these in it. They fall a couple per box. I LOVE THESE! Mystery Finest. These fall 1:36 or one per box. Love the mystery, but was just a tad disappointed when my players were Jeter, A-Rod and Griffey and I find A-Rod lol. 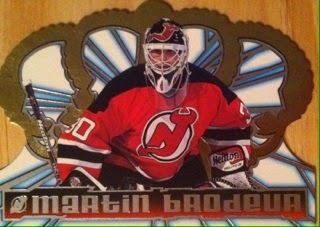 Up next is All-Matrix.. Beauty of a card! One was a GOLD and odds of pulling them, especially the first ones in the series are amazingly tough. Schilling, if I remember right, falls 1:23,000 packs (I misplaced my pack so I couldn't fully confirm this but I am pretty sure that's what it said) Booo Yah! Some are even tougher! And it's numbered to 319. In today's world this would probably fall many per box. 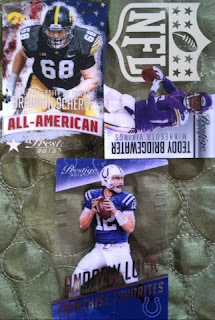 Overall, a 1:72 Ryan, a Mystery Finest, the Schilling all made this break worth while. 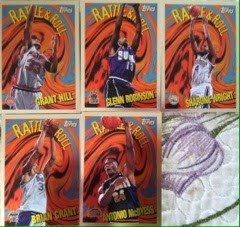 However, they don't have much value in terms of monetary, but they do represent some pretty cool 90's additions to my PC. I did okay. Can't complain with the tough hits I got and the price I paid. Better than most Topps breaks I do now-a-days. I get to give one of my favorite early season releases a second go, let's see if I was as impressed the second time with Prestige. Every box of 2015 Panini Prestige football comes with 24 packs with 8 cards per pack. You will find three autographs and one jumbo patch card per box. Boxes fall around $85. The base cards in this years Prestige are a bit different. I felt they had more high gloss than usual and they have wide open photography other than the name. I like it. 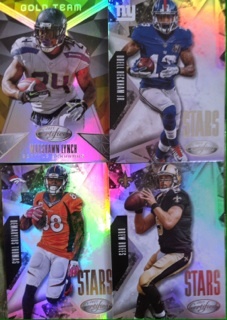 You will find one rookie card per pack. Unless you pull a variation, then you will get two. 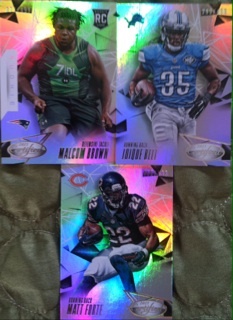 Variations this year are an improvement as well and I like how Panini did them. Instead of the usual left pose or right pose or draft day photos, these are easy to define. 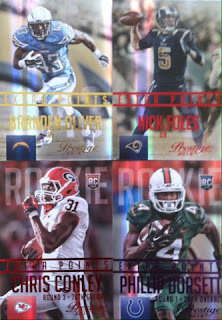 The rookie cards are college unis and the Sp variations have them in their NFL uni's. The variations on the other hand are much easier to pull as well falling at a rate of 1:6. I should have put the rookies Sp's here lol. 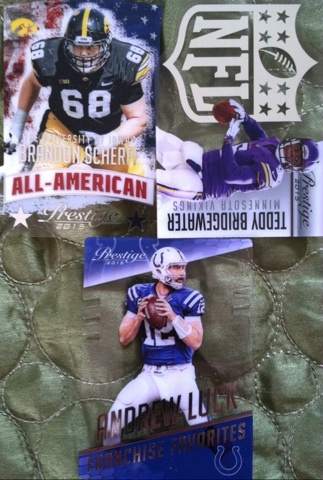 I pulled four Extra Point parallels including a Brandon Oliver numbered to 50. 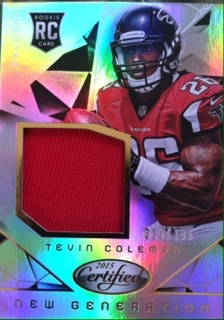 There is Red, Purple, Gold, Platinum and Black offerings. 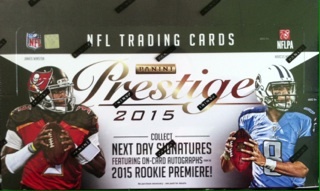 It seems the staple inserts for Prestige got a facelift as well. I like the new designs. There is also a nice mix of inserts. Some on cardboard. Some on acetate and some with etching. Makes the break more interesting then seeing the same ole, same ole. In every box you are guaranteed one patch card. They are really sharp and the swatches look nice. 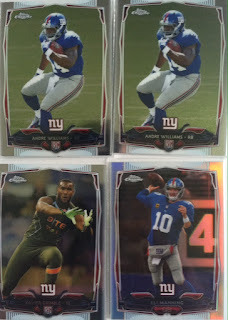 I actually pulled a parallel this time.I would assume these patch cards have the same parallels as the base cards. Three autographs per box. This time in my break, I landed two on-card ones that got signed at the premier. My other autograph in the box. POOR, POOR AUTOGRAPH. I could sign for him. Another decent break. Not a strong one in terms of big names, but this is still early so anyone could step up and be big time. 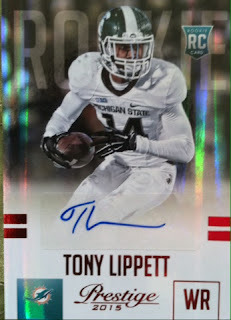 I was a bit surprised to pull Lockett again as I pulled him in my first box but as an extra points autograph in that one. If you have been a fan of Prestige over the years, you will enjoy this product. Big hit seekers, probably not as much even though there are some good hits that can be found in here. In the end, I like the new additions and new fixes in the product and probably one of the better Prestige releases to date. CONTEST! Guess My Hampton Count! Jammin JDcards Retro Breakin Wax Week! July Contest Winner! NUMBER REVEALED!